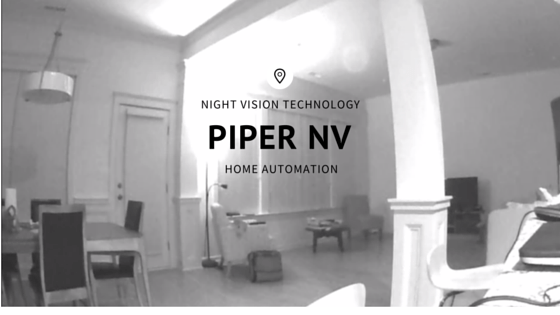 I’ve been using the Piper nv for several weeks as an addition to my home security. We recently returned from our summer vacation and the Piper nv was added piece of mind to have while traveling. The Z-wave technology allowed me to connect other home automation processes, such as controlling lights, additional sensors monitoring doors and windows, not to mention night vision technology that allowed me to log in and check on my house, even at 3:00 a.m. The Piper nv is about the size of a soda can and connects to your smart phone via wi-fi. You can place it where you would like in your home, or use the adapter and mount it. This photo was taken when I was in Florida and had turned the lamp on in the living room using Piper. However, images taken using only the night vision feature were also crisp and clear. With Piper, I am able to log in and check on things at different times throughout the day, as well as turn lamps on and off, and not worry about an automatic switch or timer starting, or not turning off. Piper nv kept me alerted to temperature changes in my house, severe weather issues, and when my best friend forgot to set Piper nv to the home setting when she was in watering my plants I was sent a text message and video started recording. 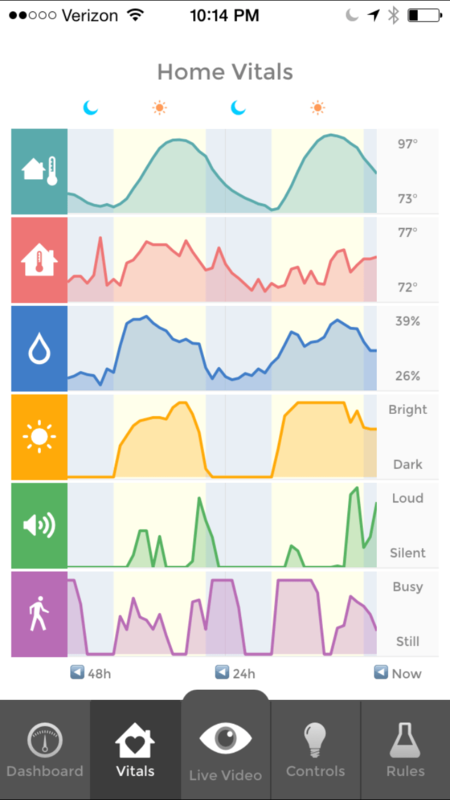 This photo is a screen shot of my “Home Vitals” as monitored by the Piper nv. This is the past 48 hours in my home, showing temperature differences, changes in light, when people are moving, and spikes in sound. It’s surreal checking on your home while you’re away and hearing the train chugging by as you sit in your hotel room far away from any train tracks. The two-way audio provided by Piper allowed me to check in and do not only a visual, but auditory check. As you know, I have a teen and his favorite thing to do so far on his summer break is nothing whatsoever. When I’m in my office working, I like to open up my Piper nv app and use the two-way radio to talk to him. I’ll be honest with you, I normally start whispering his name to see if I can get his attention. It’s also brought a little relief while he’s cooking to make sure I’m not walking into a huge mess in the kitchen. What is Piper nv missing? Not much. If your wifi was to go down while you’re away, your piper would not work. There is also no current way to export or access the data from the device. After checking their site, I couldn’t find anything about a public API, but that doesn’t mean it won’t happen in the future. My husband is a big fan of the website “If-This-Then-That” and is hoping he’ll be able to integrate Piper into his IFTT automation scripts. Would I buy Piper for myself? Without a a doubt and there are more on the way for my home, along with sensors for every window, as well as more plugs for me to automate outlets in every room. All of these items connect together and are easily monitored and controlled by your smartphone or tablet. Do you want to win a Piper nv of your own? Please enter my giveaway hosted by Rafflecopter. It runs until midnight on July 5 and the winner will be notified July 6. 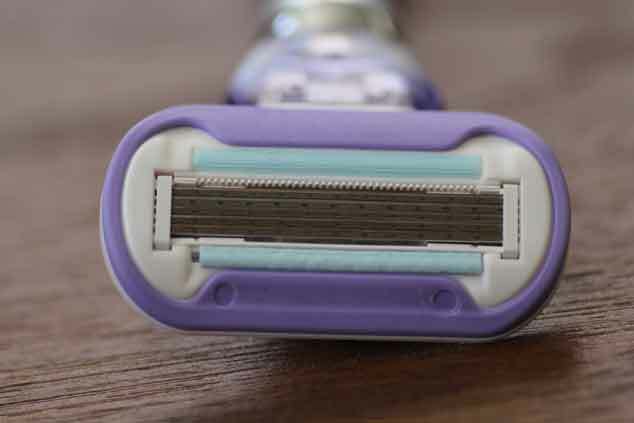 You can also visit these blogs for more chances to win a Piper nv of your own! 180 fisheye camera to monitor in many directions. Approximate retail value of the prize will be $279 USD, courtesy of Piper. No substitutions or cash exchanges. Disclaimer: I received products from Piper for testing purposes and was compensated for this post and giveaway. All opinions contained herein are my own. Thank you to Karizmac Luminous for sponsoring this review. For more information about Karizmac Luminous please visit . I’m a horoscope checking kinda gal. My star sign is Scorpio and other than some cuspy Libraness, I’m a water sign through and through. When you’re younger? You live in the stars, at least it seems as if your head does. I still check my horoscope (not daily anymore) thanks to handy apps, but generalizations for one sign just don’t do it for me. I also take the Myers-Brigg test every other month (Currently, I’m an INTJ). Let’s just say there is a lot of thought going on here. My good friends over at the Clever Girls Collective reached out and asked if I would like to test the Karizmac Luminous, let’s just say I jumped. It gave me time to sit down, dream a little and focus of life. I’ve done multiple tests on it and find myself answering different questions each time, and coming up with results that surprise every single time I use this app. For each decision you make, Karizmac Luminous shows you a famous woman who may think like you. You can discover the experiences and situations that may have influenced her decisions, and learn about how it affected her life, and often others. Then, at the end of each question category, you can challenge your self-confidence. 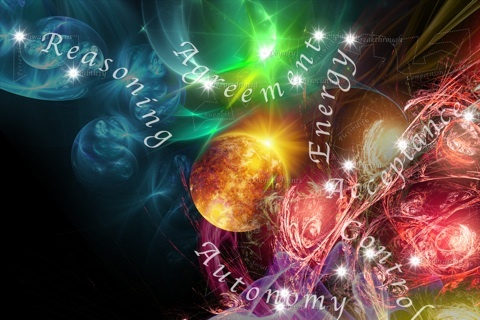 Each choice you make lights up a star in your beautiful Charisma Map. The stars align to your personality traits, so it is uniquely “you”; a snapshot of your personality at that moment. My map makes a lot of sense to me. Everybody has a different map and there are 240 different decisions with insight into 480 Luminaries who’ve made decisions such as the one you’re making. You can explore your Charisma Map by expanding and pinching the Charisma Map. As you zoom in, you can see the star that matches your individual answers, along with its Master and Sub-Category traits as constellations and galaxies. Save your Charisma Maps to compare your previous Maps with your current. And you can share them with friends through email or by posting on Facebook. I selected vision and clairity. Something I’ve been seeking in my professional and personal life. Imagine my surpise to be compared to Annie Liebovitz, June Carter Cash, Mary Leakey, Anna Sui and Vera Wang. All of my Charisma Maps are stored on my iPod touch, so I can go back at any time and see how my decisions affected my day. Or how my answers in my categories could vary due to changes in mood. Will I use it everyday? Quite possibly. I like reading into myself. That inward focus helps me take a hard look at myself and be a better person. I am seeing though this app where my associations lie, what my true feelings are on different statements that come from deep within and remind myself that I’m a gutsy broad. Just like the featured Luminaries. While Karizmac Luminous provided me with the app to review, the opinions I’ve expressed here are solely my own and represent my honest viewpoint. Karizmac Luminous, Clever Girls Collective and I promote Blog With Integrity.